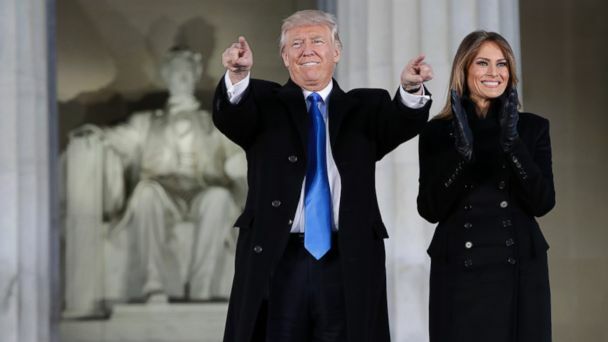 President-elect Donald Trump addressed the crowd at his inaugural concert a day before officially being sworn in on Friday -- calling himself the "messenger" of a movement and portraying himself as the champion of the "forgotten man" and "forgotten woman." "This journey began 18 months ago," he said in the brief remarks, following the country music-heavy concert. "I had something to do with it but you had much more to do with it than I did. I'm the messenger," Trump said at the Lincoln Memorial. "We all got tired of seeing what was happening and we wanted change but we wanted real change," he said. "On the campaign I called it the forgotten man and the forgotten woman," he said. "Well, you're not forgotten anymore. That I can tell you. Not forgotten anymore." Trump said that he didn't care if the weather was nice or not for the inauguration because "I'm going to be cheering you on -- you're going to be cheering me on but I'm going to cheer you on. "We are going to make America great again, and I'll add greater than ever before," Trump said. This wasn't the first time Trump made public comments today. When he arrived in the nation's capital earlier today, he used a leadership luncheon as an opportunity to boast about his Cabinet picks. "We have by far the highest IQ of any Cabinet ever assembled," he said. Trump highlighted Rep. Tom Price, his pick for secretary of health and human services, who was at the Trump International Hotel luncheon. Trump said Democrats "wanted to end [Price's] career so fast, and then they found out he's so smart." He went on to praise other Cabinet picks, calling Sen. Jeff Sessions "legendary" and saying Steve Mnuchin was "getting grilled" during his confirmation hearing and "he's doing a fantastic job." Trump touched down at Joint Base Andrews on board a military plane at 12:05 p.m. with his family, including his sister. They then were transported to Trump International Hotel for the luncheon. Trump and his family left the Trump International Hotel spent some downtime at the Blair House on Pennsylvania Avenue before heading to Arlington National Cemetery, where he laid a wreath with Vice President-elect Mike Pence. From there, the Trump family crossed back into D.C. to begin the more festive portion of the day with the Make America Great Again! welcome celebration. The concert is being held outside the Lincoln Memorial and include performances by country music star Toby Keith and rock band 3 Doors Down. Academy Award-winner Jon Voight spoke at the start of the ceremony, saying that it was a day to celebrate after a "grueling year and a half." He said that Trump supporters made it through "not knowing if God could reverse all the negative lies against Mr. Trump, whose only desire was to make America great again. "He certainly didn't need this job," Voight said of Trump, adding "and yes God answered our prayers because here it is." While the concert is open to the public and will be nationally televised, the last stop on Trump's public schedule for the day is far more exclusive. The president-elect and his family, along with Vice President-elect Mike Pence and his family, are expected to stop for a candlelight dinner at Washington's Union Station. The dinner won't necessarily be intimate - many inauguration and campaign donors are slated to attend as well - but it may be one of the smaller events that Trump attends over the course of the next two days.